I had a fun day in Seattle yesterday with a fellow jeweler. First stop was Ventures - Gifts for Good in Pike Place Market. I had a meeting with staff to review my inventory there and to add more. They are stocking up for the coming tourist season and their 20th anniversary. This unique and inspiring gift store is the "retail incubator" of Washington C.A.S.H. (Community Alliance for Self-Help). Their stores showcase handcrafted products from their program’s participants and other local and low-income entrepreneurs, offering direct market access as well as hands-on training in retail product development, pricing, and presentation. Working together, they are committed to the growth of small businesses, stronger communities, and brighter futures throughout the Puget Sound region and beyond. They have a nice selection of art and gifts, many from friends of mine such as Kaleidescapes, Eastern Wind Glass and Echo Artworks. I added 2 dozen more Beadware stone necklaces and many more pairs of earrings to their Beadware inventory. (Which means I will be working hard in the studio today!) You can find Ventures in the historic Seattle Pike Place Market at 1st Avenue and Pike St. on the Mezzanine Level, under the main arcade, in Suite 521. Easy directions are to start at the pig, walk down past the fish tossers and hang a right! Next stop (well, after lunch!) was Seattle Findings. I stumbled upon this place online when searching for sources for tool. I had never heard of them before. The storefront was on the 3rd floor of an office tower. We made a few purchases, things too heavy to have mailed. Looks like they do most of their business online. You will find good sale prices and useful resources on their website. Last stop was Canopies by Fred for a new tent bag. My last one blew up so I got a nice, sturdy, roomy one. Can't wait to use it tomorrow! 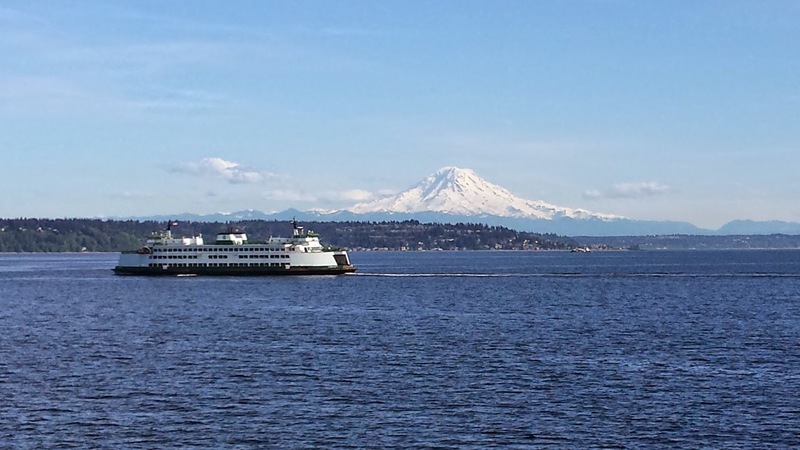 It was a gorgeous day to be gallivanting around Seattle and riding a ferry across the sound. Now that my show season is starting it is time to begin this fun series of posts where I feature other artist I meet at shows. Last week I had a table at the International Therapeutic Touch Conference at Cedarbrook Lodge in Seatac. First of all, wow what a place!! A relaxing spa right near the airport. Have to remember that next time I have an early flight out. The conference attracted healing practitioners from all over the world. 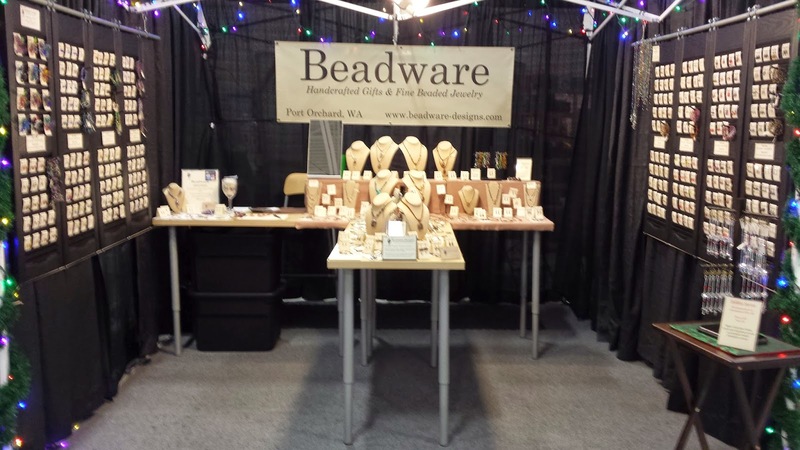 I am pleased to say that my jewelry went home with folks from eastern Canada, the southeastern U.S, Alaska and Australia! I also learned all sorts of interesting things and was treated to the sound of Tibetan Singing Bowls. You can learn more about them and how they are used for healing at the website of one of the vendors, Arizona Sound and Music Therapy Institute. I also met Shabenna Helsley, Inspire Me Mandalas, and learned about her gorgeous mandalas. Mandalas are a unique and handmade form of spiritual art which incorporate color, design, and shapes to create emotion, healing and interest. The word "mandala" comes from the Indian language, Sanskrit, meaning "circle". This primordial shape symbolizes many qualities such as unity, wholeness, perfection and divinity and has been prevalent in most cultures around the world. The center of the mandala represents our spirit or awareness. Shabeena takes you on a tour of her process via a video on her website. As she creates she draws from a very long tradition. Each stroke, color, shape has connection to the Chakras, geometry and numerology. Her work is extremely intricate and beautiful. Once you watch her informative video you will see mandalas everywhere! Did you know that the purple color of amethyst is due to its iron content? Mystical power: Given as a symbol of sincerity, security, and peace of mind. Cures impatience, balance high-energy, eliminate chaos, promote clarity, and help keeps one grounded. Activates and balances the 6th chakra (third eye). Ancient folk believed it protects against drunkenness. As the myth goes, drinking wine from an Amethyst goblet would prevent one from becoming inebriated. The gemstone still symbolizes sobriety. Associated with a number of superstitions, being regarded as a love charm, and protection against thieves. Placed under the pillow at night, the beautiful amethyst is believed to produce a calm and peaceful sleep. I have been working hard stocking up for this years show season. My to do list is huge so it can feel overwhelming. Where to start? I break it into manageable pieces by working by color. If you have ever been into my booth you may have noticed that it is organized by color. The shutters on one side are cool colors and the other side is warm. The necklaces on the table tops follow this pattern also. This last week I have been tackling cool colors. Bright multi-colors, greens, blues and finally purple. I start by refilling each shutter, going over each pair of earrings and polishing or tweaking as needed. Then I can see what my needs are for backup. I also put a few bracelets on each shutter and so this is a chance to see what gaps I have there. Then it is time to make things. New this year will be the addition of more stone earrings and bracelets and less glass only items. but this one continues to be a best seller. our local sports teams, Seahawks and Mariners. Lapis lazuli earrings. Such a luscious color! Just for fun green glass. Green jasper bracelets and earrings. Just for fun glass earrings. And lastly amethyst earrings and bracelets. Looking for a fun way to treat yourself? How about a spa day or weekend at Angeline Spa at the Clearwater Resort in Suquamish! And while you are there you can shop from a recently re-stocked selection of Beadware stone necklaces. Belinda, the manager, and her staff are very personable and will make your comfort and relaxation their top priority. Check out their website or give them a call at 360-598-1420 for more information.